Late Night Hoops visited a Palm Beach State (Fla.) practice several months prior to the article and believed either player could be provide a significant boost to the roster. As things turned out, Holton wound up at West Virginia and Kevin Thomas at Troy. Let’s take a look at how they are performing this season. Ask LNH: Is Tyus Jones Overrated? No. If anything, the 2014 RSCI #7 Jones is underrated. His feel and understanding of the game of basketball is truly special and nothing short of remarkable. You’ll often see him described as a “pass first point guard” along with a comment about his relative lack of athleticism. The “pass first” description is fine, but make no mistake – Tyus Jones can put points on the board with the best of them and will get flat out nasty scoring the ball when he needs to. College basketball fans across the country will say, “Wow, I didn’t know Jones could do THAT” this year. 2015 C/PF Jonathan Nwankwo, 6’9″, 245 pounds, committed to the Minnesota Golden Gophers today while on his official visit. He’s a New Yorker who plans to play this season in Florida at Victory Rock Prep. The relationship between him and the Gophers goes back more than a year. As was the case with fellow 2015 commits Dupree McBrayer and Kevin Dorsey, the pledge to Minnesota was not a surprise. With 5th year seniors Elliott Eliason and Mo Walker finishing their careers before next summer, Nwankwo will have an opportunity to earn minutes both as a center and power forward. He’s a big, strong kid who can help rebound and defend (so long as he keeps fouls in check) early on. How well he progresses with the ball in his hands is up to him and the staff. The potential is there to be a quality player for Pitino. The scholarship table has been updated and is included at the end of these notes. This commitment is not at all a surprise and we’ve long thought he’d wind up a Gopher. Nonetheless, McBrayer is a very good addition to the program. 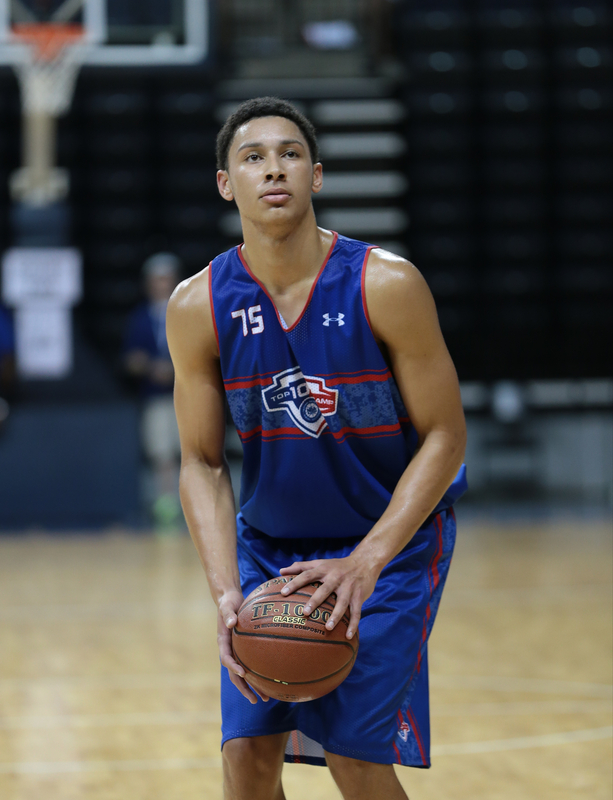 The 6’4″ lefty guard may grow a bit taller despite already being 19. He’s been at various high schools and needs to finalize a decision on his prep school for this year. Vermont Academy, where rising sophomore Daquein McNeil attended, is a strong possibility. Talented and exciting scorer. He can put on a show and wow the crowd. Capable of bringing the ball up the court, but figures to play off the ball on offense. Not a lot of physical strength, but his size should enable him to defend multiple positions (1, 2 and 3). LNH last saw him in person a few weeks ago in Vegas where he played with New Heights. Gopher assistant Kimani Young was the director of the New Heights organization and a consistent spectator at McBrayer’s games. Dupree was impressive when viewed live. However, he had at least 2 years on most of the competition. How much did he benefit from the age advantage is a relevant question. 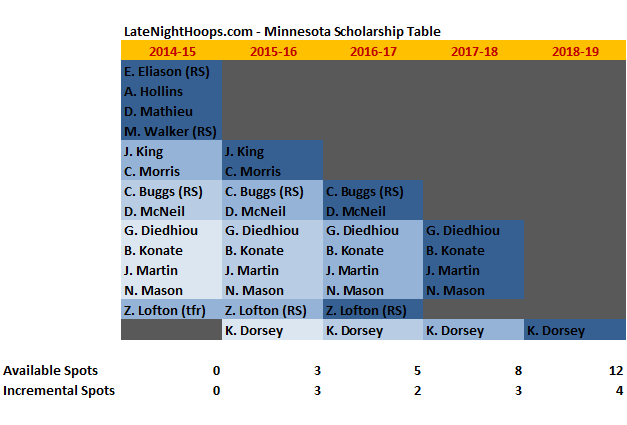 Minnesota will now have two big guards/wings who are aggressive scorers in Zach Lofton and Dupree McBrayer. The 2015-16 Gophers will be able to unleash a mean attack on opposing defenses. 8/26/14 edit: Not a surprise, but Gaston Diedhiou is not expected to join the program this fall. Based on the roster makeup we do not see this as a significant issue. 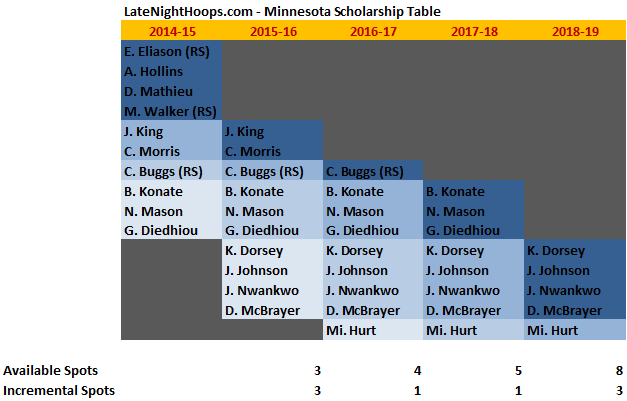 The scholarship table below includes Diedhiou, but most likely he will never join the program. Thus, the Gophers still have 3 “open slots” for new scholarship players in 2015 after the McBrayer commit. This year’s Nike Global Challenge finished today. Schedule and game results can be found at NikeGlobalChallenge.com. Attached is a summary compilation of team and player stats, including traditional and advanced statistics for each player. The pace was hot (91 poss / 40 minute game) and 2-point attempts were converted at a strong 53.9% rate, but we saw some poor outside shooting. Teams shot sub-30% 3FG% (the U.S. teams had a lower 3FG% than the international teams) and some big names were among the worst, including Malik Monk (1/19 for 5%) and Antonio Blakeney (3/23 for 13%). Advanced stat studs include: Noah Dickerson, Stephen Zimmerman, Jalen Brunson, Edrice Adebayo, Tyler Davis, Chris Clarke, Khalea Turner, Esa Ahmad, Omari Spellman and Dedric Lawson. 2015 guard Kevin Dorsey committed to the University of Minnesota. He’s a nice addition with work to do offensively, but with the speed that Pitino and staff should put to good use defensively. Late Night Hoops has calculated various advanced statistics from the games played at last weekend’s NBPA Top 100 camp. Certain of those stats are shared here. In addition, there is an easy way to obtain our player statistics in Excel format. If you’d like player statistics in Excel format, please request a copy by emailing jbbauer612@gmail.com.